Plants perennial, mat-forming; rhizomes evident, long, 1-2 mm thick, firm, cortex persistent, longer internodes 10-55 mm, scales often fugaceous, 5-10 mm, membranous, not fibrous. Culms terete to markedly compressed, to 3 times wider than thick, often with to 25 blunt ridges when dry, 10-100 cm × 0.5-2.5(-3.5) mm, firm (to soft), internally spongy. Leaves: distal leaf sheaths persistent, rarely splitting abaxially, proximally mostly red, distally green (or red), papery (to membranous), apex truncate to obtuse, tooth sometimes present on some or all culms, 0.1-0.6(-1) mm. Spikelets narrowly lanceoloid to ovoid, 5-40 × 2-5 mm, acute, rarely obtuse; proximal scale clasping (2/3-)3/4 or more of culm to amplexicaulous, usually variably in same plant; subproximal scale empty or with flower, usually empty in some spikelets and with flower in other spikelets in same plant; floral scales deciduous, often spreading in fruit, 30-80, 3-5 per mm of rachilla, medium brown, sometimes red-brown or dark chestnut-brown, midrib regions often stramineous to green, ovate to narrowly lanceolate, 2.5-5.5 × 1.5-2.5 mm, entire, mostly carinate in distal part of spikelet. Flowers: perianth bristles 4(-5), sometimes rudimentary or absent, brown, slender to stout, much shorter than achene to equaling tubercle; stamens 3; anthers dark yellow to orange-brown, 1.3-2.7 mm; styles 2-fid. Achenes not persistent, yellow maturing to yellow-brown or dark brown, ellipsoid, obovoid, or obpyriform, biconvex to plano-convex, angles obscure, 1.1-1.9 × 0.8-1.5 mm, apex rounded, neck absent or short, smooth at 30X, or finely rugulose at 10-20X with 20 or more horizontal ridges in a vertical series. Tubercles brown to whitish, pyramidal, as high as or sometimes much higher than wide, 0.35-0.7 × 0.25-0.7 mm. 2n = 18, 19, 38. Fruiting spring-summer, all year in s Texas and Louisiana. Fresh to slightly brackish or alkaline shores, stream beds, swales, vernal pools, pastures, ditches, artificial ponds; 10-2300 m; Alta., B.C., Man., Ont., Que., Yukon; Alaska, Ariz., Ark., Calif., Colo., Idaho, Ill., Iowa, Kans., La., Minn., Miss., Mo., Mont., Nebr., Nev., N.Mex., N.Dak., Okla., Oreg., S. Dak., Tex., Utah, Wash., Wis., Wyo. ; Mexico; South America (Argentina, Colombia, Uruguay). The chromosome numbers 2n = 10 and 2n = 16 have also been reported from North America but have not been verified. Eleocharis macrostachya probably occurs in Saskatchewan; I have not seen specimens. It is extremely variable. Cytotaxonomic studies (S.-O. Strandhede 1967; L. J. Harms 1968) and morphology suggest that it is a diploid-polyploid complex at least partly of hybrid origin from E. palustris and both E. erythropoda and E. uniglumis. The 2n = 38 plants of E. macrostachya may comprise the American counterpart of the European E. palustris subsp. vulgaris, which presumably originated from E. palustris subsp. palustris and E. uniglumis (S.-O. Strandhede 1966). Although recognition of infraspecific taxa is premature, the following three intergrading variants are notable: Variant a (= Eleocharis xyridiformis) almost certainly deserves taxonomic recognition, perhaps as a species. It has markedly compressed culms to 3 times wider than thick; distal leaf-sheath apices subtruncate, usually with a tooth to 0.6(-1) mm on some or all culms; spikelets narrowly lanceoloid; floral scales medium brown to stramineous, mostly lanceolate and carinate, 2.5-4 × 1.5 mm; achenes 1.1-1.5 × 0.8-1.2 mm; chromosome numbers (for which I have seen vouchers, all from Kansas and South Dakota), 2n = 18. It is known from 20-450 m in Arizona, California, Illinois, Kansas, Missouri, New Mexico, Oklahoma, South Dakota, Texas, and Mexico (Coahuila, Durango, Nuevo León). Both the holotype of E. xyridiformis from Mexico and the vouchers of the 2n = 18 chromosome counts reported for E. xyridiformis, all from Kansas and South Dakota, have stomates 55-60 µm, which is typical of 2n = 18 plants (S.-O. Strandhede 1967). The holotype of E. macrostachya from Oklahoma, which is otherwise much like the type of E. xyridiformis except for less markedly compressed culms, has stomates averaging 59-68 µm, which is typical of plants of E. macrostachya with 2n = 38 as in variant b. Variant b is very variable in comparison with variant a. It differs from variant a in having culms terete or slightly compressed; distal leaf-sheath apices often obtuse, tooth rarely present, to 0.1 mm; spikelets broadly lanceoloid to ovoid; floral scales 3.5-4(-4.5) × 1.7-2+ mm; achenes 1.3-1.5 mm, rarely to 1.8 mm; culm stomates 60-72 µm; chromosome numbers (for which I have seen vouchers, all from Kansas and South Dakota), 2n = ca. 38. It is wide-ranging, known from inland localities at 20-2300 m from Manitoba west to Yukon and British Columbia, south to Alabama, Mississippi, Louisiana, Texas, New Mexico, Arizona, and California, and in Mexico from Baja California. Intermediates between variant b and both Eleocharis erythropoda and E. uniglumis are widespread, and intermediates with E. ambigens occur in Louisiana. Most plants of variant b have floral scales to 4 mm and achenes to 1.5 mm; plants with scales to 4-5 mm and achenes sometimes more than 1.6 mm occur in California, Nevada, Oregon, and Washington. Variant c differs from variant b in having spikelet scales mostly uniformly dark chestnut-brown, not carinate, (3.5-)4-5.5 × 2-2.5 mm. Its achenes are often unusually large, 1.3-1.8(-2) × 1.1-1.5 mm. It is known from near sea level on the coasts of British Columbia, Ontario, and Quebec (James Bay and Magdalen Islands); Alaska, California, Oregon, and Washington. Some plants are intermediate between variant c and variant b. 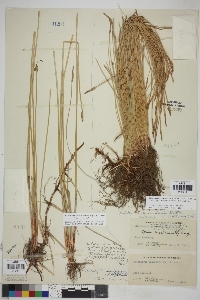 Several specimens I have seen from far eastern Russia are very similar to American plants of Eleocharis macrostachya, variant c. Except for having incompletely amplexicaulous proximal scales, and subproximal scales often without a flower, variant c closely resembles many Eurasian specimens of E. uniglumis. Perennial herb with long slender rhizomes, mat-forming 10 cm - 1 m tall Leaves: reduced to bladeless sheaths, basal, two per culm, margins fused and enclosing culm, rarely splitting, papery, red basally, with a blunt to nearly truncate (cut straight across) apex that sometimes bears a tiny tooth. Flowers: minute, spirally arranged on the axis of the spikelet, lacking sepals and petals, with four (sometimes zero) bristles, subtended by a scale. Bristles brown, shorter than achene, slender to stout. Stamens three, exserted. Anthers dark yellow to orangish brown, to about 2.5 mm long. Pistil one. Style two-cleft. Fruit: a one-seeded achene, yellow becoming brownish, 1 - 2 mm long, to 1.5 mm wide, ellipsoid or reverse egg-shaped or reverse pear-shaped with a rounded apex, biconvex (or convex on one side and flat on the other), smooth (at 30X), or finely wrinkled (at 10-20X). Tubercle tiny, whitish or brownish, pyramidal. Seed with a thin, non-adherent wall. Culm: unbranched, 10 cm - 1 m long, 0.5 - 2.5 mm wide, circular in cross-section or compressed to three times as wide as thick, spongy within, enclosed basally by two fused sheaths. Spikelets: solitary, 0.5 - 4 cm long, 2 - 5 mm wide, narrowly lance-shaped to reverse egg-shaped with a pointed apex, with 30 to 80 floral scales. Scales spirally arranged and overlapping, brown or sometimes dark brown or reddish brown, with a straw-colored to green midrib, 2.5 - 5.5 mm long, 1.5 - 2.5 mm wide, egg-shaped to narrowly lance-shaped. Habitat and ecology: Rare in the Chicago Region. Has been found in a dry pond in a prairie swale. Typical of wet areas. Etymology: Eleocharis comes from the Greek words heleios, meaning "dwelling in a marsh," and charis, meaning grace. Macrostachya means "large flower spike."